After Queen Letizia debut all the big Tiaras I wounder what will she debut next? I would like to see her with collet diamond necklace from the Joyas de Pasar. And there are plenty other necklaces who could be brought out. That is a nice theory, but she already debuted Queen Ena's Cartier pearl tiara this April at the State Banquet for Portugal. I find it amazing, that she debuts two important tiaras in a row. She could have waited with one of them, but for some reason she didn't. Not that I mind, though. 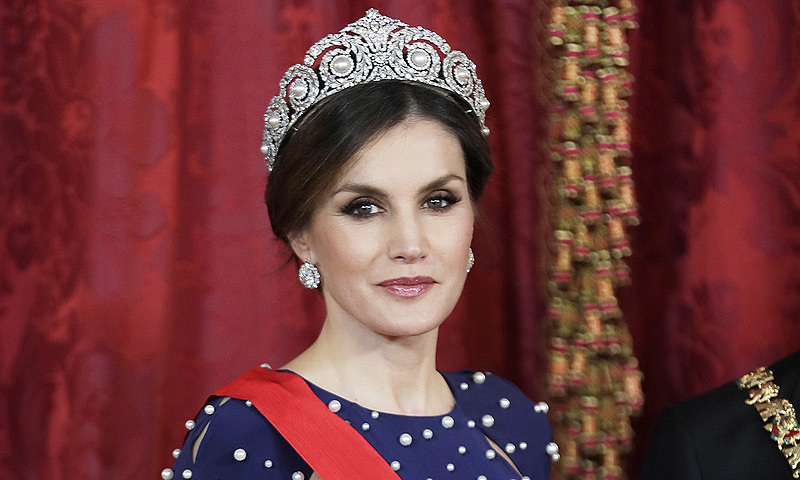 Queen Letizia will wear all the Spanish tiaras except the Prussian tiara who belongs privately to Queen Sofia. Letizia seems to have an aversion to necklaces and rings ,both only appear once in a blue moon,I don't think we've seen her wear any rings so far in 2018. She has worn the prussian tiara plenty of times as Princess of Asturias. But no as Queen she has the choice between more tiaras. Also Queen Sofia wore it seldom. Also the floral wreath tiara and the Mellerio Shell tiara are owned by Queen Sofia as she got them as Wedding presents. I think we will see the prussian tiara next on Leonor. I've never really considered the Prussian Tiara as a queens tiara but an ideal choice as a starter tiara for an Infanta/Princess. I agree. Nevertheless, I hope to see the tiara again on Letizia, rather the Prussian than always the Floral. So it is with the royals, Whenever I think they have a sytem, which tiara is worn when, they surprise me. I think every future state visit to another royal house will be a surprise. Sofia carried the Fleur de lys only on a state visit to England and Belgium, in the Netherlands it was the Floral and the Shell, in Sweden the Floral, Prussian, Ruby, in Norway the Shell and Prussian Loop, in Luxembourg the Ruby Cartier Pearl. Yes Sofia owns alot of necklace but i think We have to be satisfied with the earrings. After she debuted all Tiaras (not the ruby) I think upcoming state visits will tell which Tiaras she favor. shell and prussian have not been worn as queen, and the prussian tiara might go wherever sofia wants it to go, but i do hope to see the shell tiara once more. Let's not forget that the floral tiara was another wedding present to Queen Sofia, and Letizia has worn it loads of times after becoming Queen. I tend to think that it's simply her favourite, and it suits her very well, doesn't it? Letizia seems to be a person who likes to stick to her favourite jewels. Remember the time when she constantly wore her diamond star earrings? It's nearly always the same fleur-de-lys brooch for her, and she constantly wears her wide diamond bracelets, both the bracelets from the joyas de pasar, and the before that the Cartier bracelet. I'd like to add that the floral tiara always was a favourite with Queen Sophia and Infanta Cristina as well. It's the tiara Sophia herself has most often worn. And at events with more than one Spanish royal lady present, the floral hardly never stayed at the vault. So, it's all the more astonishing that she has debuted both of the grand pearl tiaras this year. It's as if she's really gone out of her way. That was really a treat for us tiara watchers! Even though the floral tiara is beautiful, I am glad that Letizia now starts wearing the bigger guns in the collection, because to me the floral tiara is quite girly too and for me it would be a good idea to keep it in the vault for Leonor and Sofia instead of putting it on the head on an almost 50 year old Queen who has much better options now. On the other hand Queen Sofia also wore it a lot in the 1990's early 2000's despite her other options. Both new tiaras are gorgeous on Letizia. the looks are very similar. dark conservative dresses, same earrings and hair similar. Its a perfect Queen look. Spain has some incredible jewels!!! Yes, and I did not like it on her, either. I think the floral tiara is young and fun but does not look good anymore on a middle aged Queen, no matter who she is.